The Sephardic communtiy has a unique mystical tradition for Rosh Hashanah. Symbolic foods are served at a Rosh Hashanah Seder. Some of these foods are also puns, and are called “simanim,” or “signs.” Special blessings starting Yehi ratzone, Hebrew for “May it be God’s will,” are chanted over these dishes. Here are some of them, and the traditions associated with them. Recipes and more blessings after the jump. Black-eyed peas and fenugreek are stewed with veal. This dish is called Lubiya. Here is a recipe adapted from Gilda Angel’s Sephardic Holiday Cooking . Cut up the onion and garlic. Saute them in 3 tablespoons of olive oil. Add the veal cubes. When the veal has browned add all the other ingredients. Bring to a boil, and then lower the heat. Let the casserole simmer for at least one hour. Serve hot. The word for “nut” in Hebrew is “egoz.” Its gematria or numerical value is “chet” which means “transgression.” In order to avoid transgressions during the new year, even foods that carry the suggestion of a transgression are avoided. It is traditional to serve chraime for this course. Chraime is a fish and vegetable casserole. I found this recipe on Wikia. Cut up all the vegetables and place in a pot. Lay the fish on top of the vegetables. Sprinkle with salt and paprika to taste. Drizzle with olive oil. Add the water. Cover the pot tightly and bring to a boil. Allow to simmer for 30 minutes. May be served at any temperature. Some Sephardic families avoid consuming honey during Rosh Hashanah. In Ancient Israel, honey would render the incense used in the Temple impure if it was added to it. For a pure and sweet Rosh Hashanah, they dip their bread in sugar. It is customary to wish for a year with as many blessings as there are grains of couscous in a bowl. Seven appears many times in the Torah. It epitomizes blessings, good luck, and Creation. Here is a recipe adapted from Christine Benlafquih. In a heavy pot, heat the olive oil over a medium flame. Add the onions. Cook the onions until they are translucent. Add the turmeric, ginger, cumin, and coriander. Stir well. Add the tomatoes, celery, carrots, cabbage, zucchini, and pumpkin. Drain the chickpeas, and add. Pour in the water, and bring to a boil. Add salt and pepper to taste. Lower the heat, and allow to simmer for 20 minutes. Mix the dry couscous with 1/2 teaspoon of salt in a bowl. Pour 2 cups of boiling water into the bowl. Cover tightly with plastic wrap. Allow the couscous to steam for 15 minutes. Fluff the couscous with a fork. Spoon it into a bowl. Place some of the vegetable mixture with sauce over the couscous. Sprinkle some minced cilantro on it. Quinces are native to the Caucasus. They are from the same family as apples and pears. Moroccan Jews have the custom of reciting the shehechiyanu and “Yehi Ratzon” blessings over a candied quince. Here is a recipe for making your own candied quince. 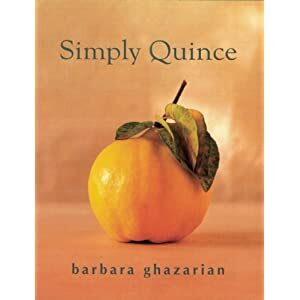 I adapted it from Simply Quince by Barbara Ghazarian. Core and peel the quince. Cut it into thin slices. Pour the water and sugar into a heavy pot. Cook over medium heat while stirring until the sugar completely dissolves into the water. Add the quince and simmer for 45 minutes. The quince slices will be soft and have a rich golden red color. 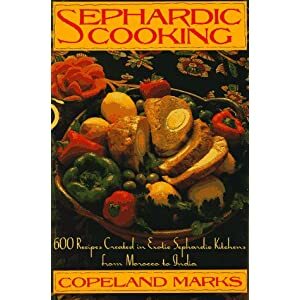 Spaghetti squash and pumpkin are thought to be “qara.” Here is a traditional Rosh Hashanah recipe for Tirshi (Pumpkin Salad) adapted from Copeland Marks’ book, Sephardic Cooking . Mix all the ingredients in a bowl. Check the seasoning. Chill in the refrigerator for at least one hour. Saying the blessing over a challah is a tradition acquired in Germany, which spread to all of the Eastern European Jewish communities. In the Sephardic tradition, the blessing over the bread is chanted over flatbreads. The round shape of the flatbread connotes the same symbols as the round shape of the Rosh Hashanah challah. It symbolizes the never-ending circle of life and the yearly cycle. It helps us express our wish for a good year, which will bring blessings, peace, prosperity, and sweetness. Twelve flatbreads are baked and arranged in the same pattern as the showbread used in the Temple. The two flatbreads on the top are held together for the blessing. Here is a recipe for Homemade Pita Bread adapted from Saad Fayed. Mix the warm water, sugar, and yeast in a bowl. Cover the bowl with a kitchen towel, and let stand for 15 minutes. Add the flour and salt. Mix everything together. Sprinkle some flour on your kitchen counter, and turn the dough out onto it. Knead the dough with your hands for about 15 minutes. Oil a bowl with olive oil. Place the dough in bowl, turning it over to coat it with oil on all sides. Cover the bowl with a kitchen towel. Let it rest in a warm place, away from drafts for 3 hours. Preheat your oven and cookie sheet to 500 degrees Fahrenheit. Take out the dough and roll it into a thick rope. Slice it into 10 pieces. Roll each piece into a ball, and then flatten it with a rolling pin. To bake, place each disc of dough on the hot cookie sheet. Let it sit in the oven for 4 minutes. Flip it over and let it bake for another 2 minutes. When you remove it, the pita bread will be puffed up. Leeks are called “karsi” in Aramaic, which is related to the Hebrew “karet” which means “sever, destroy, or cut off.” They are accompanied by a prayer to God to cut off our enemies. The traditional way to serve leeks is to prepare leek fritters. 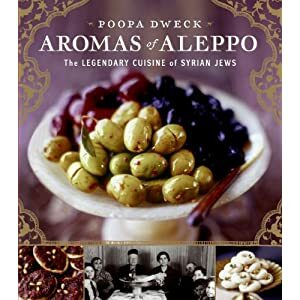 Adapted from Aromas of Aleppo by Poopa Dweck. Slice the leeks and saute them in olive oil. Set aside to cool. Mix the all the remaining ingredients except the olive oil in a bowl. Incorporate the leeks into the mixture. Heat the rest of the olive oil in a heavy pan over a medium flame. Spoon the leek batter into the hot oil. Turn the fritters over. They are ready when they are a golden-brown color. Dates are called “tamri” in Aramaic. “Tamri” means “to finish.” The blessing over dates experesses the hope that our enemies will end their enmity. Fresh dates from Israel, unadorned, are delicious with this blessing. Some families have the tradition of dipping their dates in a mixture of anise seeds, sesame seeds, and powdered sugar. The Aramaic for beets is “silka” which sounds like the Hebrew word “siluk.” “Siluk” means removal. We pray that our enemies will be removed. Here is a recipe inspired by Joan Nathan. The traditional way to serve apples in the Sephardic Rosh Hashanah table is called mansanada. Mansanada is a type of apple compote. This recipe is adapted from Midrash Ben Ish Hai. Core and quarter the apples. Peel and slice them. Arrange the slices in a pot. Sprinkle the sugar and ground cloves or cardamom over them. Pour the water into the pot. Bring to a boil, and then simmer for about 10 minutes. Remove the apple slices with a slotted spoon. Allow the liquid to continue cooking until it is transformed into a syrup. Pour the sauce over the apples. I like to serve a whole, smoked fish, like a mackerel. It is very elegant with its beautiful golden color. As there are protective amulets, so there are protective foods. Long standing traditions dictate that the new year must be welcomed with the proper foods and blessings to merit life, sustenance, and the opportunity to perform mitzvot. Yehi ratzon! Shana tova. For more hands-on Rosh Hashanah ideas please visit my new blog.